A South Australian nursing home has been sanctioned by the Australian Government after failing 22 of the 44 minimum care standards.Andrewartha Aged Care failed to provide appropriate clinical care; had unsafe medication administration practices; doctored incident reports; didn’t feed residents enough or ensure adequate hydration; and didn’t treat wounds properly. Unsurprisingly, the home did not have sufficient or appropriately skilled staff to care for residents. Surprisingly, the home passed the palliative care standard, despite failing staffing, medication management and clinical care standards. Somehow without properly skilled staff, palliative care delivery was working fine. The Aged Care Quality Agency, which is responsible for checking facilities against the standards, decided not to revoke the home’s accreditation because it had a ‘sound history’ of passing accreditation since 2000. This is important. South Australia is also home to the Australian Government’s hush hush trial to reduce quality checks in nursing homes. Ten operators running 60 services in South Australia are participating in the 12-month trial. If it receives a positive evaluation, regulation will be reduced for nursing homes which consistently pass accreditation checks across the country. Nursing homes like Andrewartha – at least before it was sanctioned. Over 90 per cent of nursing homes in Australia have consistently passed accreditation with perfect scores. This suggests almost all nursing homes in Australia will be eligible for reduced accreditation. No one has been able to explain how consistently passing re-accreditation checks, checks about which the nursing home is given up to 8 weeks’ notice, removes the need for continued quality checks. As Andrewartha shows, passing accreditation is no guarantee of good performance in the future. Its residents weren’t being fed enough or given proper nursing care. These are basic responsibilities for nursing home operators which receive on average $56,000 per resident per year in Government subsidies alone. Without proper checks, it will be left to staff and residents to complain about poor care for dodgy operators to be picked up. But staff don’t complain about poor standards for fear of losing their jobs. Residents don’t complain for fear of reprisal. This is why unannounced quality checks assessing homes against all standards, unlike the current routine where annual unannounced visits only check a home against 10 or so standards, are vital to protect residents and staff from unsafe staffing practices and inadequate care. 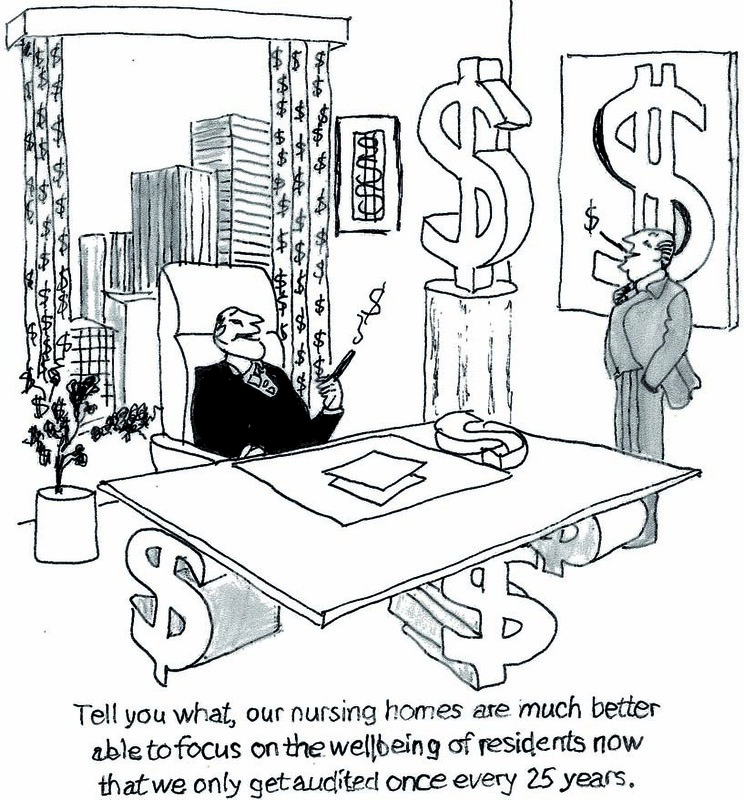 Nursing home operators need to be held to account by a robust system of regulation. Reducing quality checks will only weaken an already frail system of regulation.